Boise is the capital and most populous city of Idaho, located along the Boise River and nestled against foothills of the Rocky Mountains. As of the 2007, the Census Bureau estimates its population was 202,832 with a Metropolitan area estimated to have 587,689 inhabitants, making it the third largest city in the Pacific Northwest, behind Seattle and Portland. The Metropolitan area includes Idaho's three largest cities – Boise, Nampa, and Meridian. This area could easily be called “Boomtown USA” due to the population growth in the metropolitan area where over a half of million people call home. Boise is considered the commercial, financial, and cultural center of the northern Rockies. Boise has great city appeal combined with a huge variety of outdoor recreational activities available. Because Boseans live within a one hour's drive of the Boise National Forest, it is many things to many people. Fun activities are abundant; there's always something to suit everybody, a wonderland full of year-round adventurous opportunities. Hikers, mountain bikers and horsemen come for the scenic trails. Hot springs throughout the forest provide a pleasant respite on cool days. The popular destination of Bogus Basin Ski Resort hosts multiple winter activities, alpine skiing and snowboarding, also cross-country skiing, snow tubing and ice fishing. The beautiful Boise River, which flows through the heart of the city, provides tourist and residents alike an excellent attraction, offering more than just its beauty. Among the most popular activities include the Boise River Greenbelt. The Greenbelt pathway connects most of the city's many public parks and natural areas along the river. It accommodates walkers, bikers, skaters, joggers, runners, wildlife observers and fishermen, including a 25-mile long bicycle and pedestrian path. The River itself is a common destination for fishing, swimming and rafting. 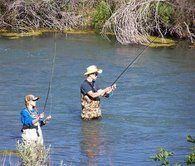 Barber Park and Eagle Island in particular are popular spots on the Boise River for fly fishing in Idaho. Among the many unique sites to visit are the Basque Museum and Cultural Center; Morrison Center for the Performing Art; Idaho Anne Frank Human Rights Memorial; Idaho Black History Museum and the World Center for Birds of Prey. Julia Davis Park sits across the river from Boise State University. Call Boise Parks & Recreation Department at 208-384-4240. Boise Towne Square Mall features over 186 stores, including: Borders, Dillard's, JC Penney, Macy's, and Sears as anchor stores. The Eighth Street Marketplace, located in the center of downtown is a popular sight to go shopping, have a bite to eat, or enjoy the nightlife. Hot summer days are tempered by the low relative humidity and cooler evenings during summer months since, for most of the state, the highest difference in temperature is often in the summer. Winters can be cold, although extended periods of bitter cold weather below zero are unusual. Summer temperature is typically in the 80's and overnight lows drop down to the 40's. Boise Airport (BOI) has numerous daily flights to major cities in the central and western parts of the United States, such as Denver, Chicago and San Francisco. The airport's terminal is located just 5 miles south of downtown.It also serves as a gateway for Idaho's back-country. Fixed Base Operators and U.S. Customs and Border Patrol are on site to provide a wide range of services for all levels of general aviation. For information please call 208-383-3110. Besides being one of the most affordable places to retire to, Boise and Nampa are ranked as the most secure locations to live in the U.S. among large metropolitan cities. Forbes has rated this city as one of the best places to live and work in the U.S.